The Currency of Romania is RON (Romanian New Leu) split into Lei (notes) and Bani (coins). Many travel agencies will tell you to take Euro but this is incorrect, your Euros will have to be exchanged for local currency. There are many exchanges available, including in Otopeni Airport, with the exchange rate around 4.5RON per Euro. There is no diffrence between Lei, Leu and RON. Otopenii - Henry Coanda Airport is a large and modern airport situated about 30 mins from the centre of Bucharest. Outside the airport,(downstairs) you will find the RATB bus station, with number 783 departing every 15 mins into the tourist centre of Bucharest, terminating at Victorei Square. An electronic 'swipe' card system is in operation onboard, tickets are avaliable from the RATB office just outside the airport doors, 24 hours a day, purchasd in RON only. The current price from Airport to city centre is 3.5RON. The buses are clean, modern and highly reccomended. Your RATB card can be used on RATB Buses and Trams across the city. For more information about the RATB click here. Outside the main exit there are numerous yellow taxis waiting to take passengers into the city. Check prices in advance. English language widely spoken. The magnificent Palace of Parliament is open daily for visitors, between 9am and 4pm, with an entry fee of 35 RON, which includes an in house tour and views from Ceaucescu's balcony. Passport I.D is required for entry and airport style security is in operation at all times. 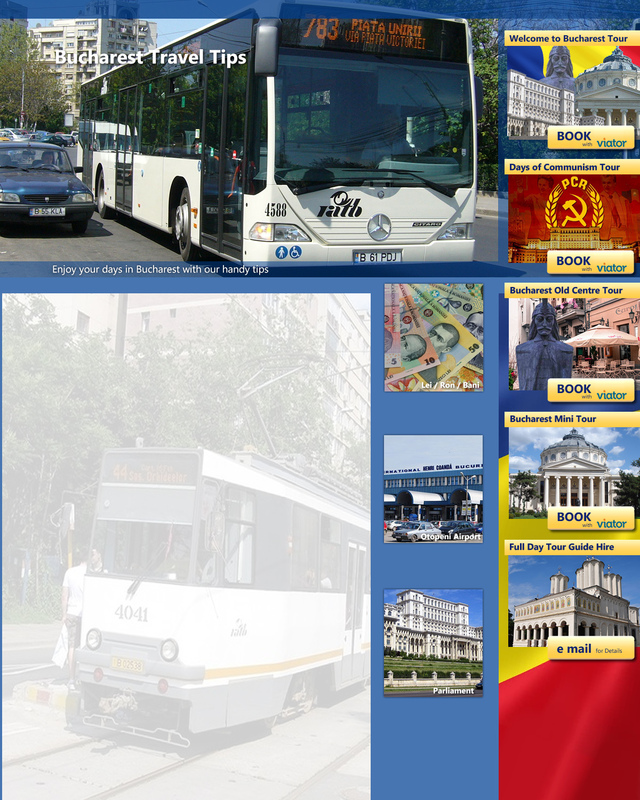 We recommend advance booking to ensure entry, which we are pleased to do for our tour parties. Entry can take up to 30 mins to pass through security in the summer months. For more information about the Parliament click here. Romania has a continental climate. In Bucharest summers are generally very warm to hot, averaging 29C(day) in the summer months of June to September. I always advise tourists to have a botle of water on hand while out in the summer sunshine. Summer nights are dry and pleasant with temperatures around 25C. The short Romanian winter can be extremely cold, with the temp dropping to a record -38 in January 2014! If you require any further information please E-mail me in advance of you trip to Bucharest, I am pleased to answer any questions you may have about your stay in the city. Alina. Tour guide at Bucharest Guided Tours.